Are Thai made vehicles good enough? For many people, there is that nagging worry as to whether a car made in Thailand is screwed together well enough. 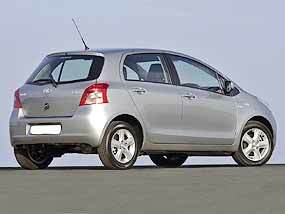 Should one stick to imported vehicles because the quality is better (or perceived to be better)? Many years ago, when BMW first opened their manufacturing plant on the Eastern Seaboard, I remember the local GM saying that the cars produced here were not “Thai BMWs”, but BMWs made in Thailand. I understood immediately what he meant. In fact, in the German BMW’s audit of the plant, the BMWs made in Thailand were some of the best in the world, as far as freedom from faults was concerned. What reminded me of all that were the results of the JD Power Asia Pacific Thailand Initial Quality Study. In this critical examination, owners of new vehicles were asked about the quality of the cars they had bought. The questionnaire covered ride, handling, braking, features/controls, seats, ventilation and cooling, sound system, exterior and interior, engine and transmission. The end result is expressed as the number of problems per 100 vehicles, and obviously, the lower number of faults the better. The latest study was carried out on almost 3,500 owners, and covered 49 different vehicles, including cars, pick-ups and utility vehicles, and spanned 10 different manufacturers. The industry average, according to the JD Power survey, was 216 problems per 100 vehicles, which was the best figure since 2003, a 14 percent improvement. And what brand came out on top? Guess! 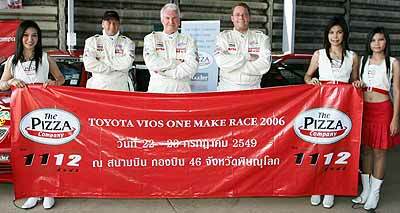 Yes, it was Toyota, top in all five categories. I actually had an interesting chat with one of the engineers from a car manufacturing plant here on the Eastern Seaboard a week ago. He was using the words “perceived quality”, but I believe the JD Power is much more objective than that, and we are not looking at subjective results here. Certainly Toyota is ‘perceived’ by the buying public as having reliable vehicles, and quite honestly, I believe they do! Even though I personally think that the sample size was a little small, the results did come out as I imagined, with Toyota Yaris on top of Honda Jazz in one class, Corolla Altis followed by Mitsubishi Lancer and Honda Civic in another and the Hilux variants on top of the various pick-up based segments such as single and double-cab and extended cabs. So the answer to the question as to local quality, the answer is yes, Thai made vehicles are certainly well made. I was very fortunate in being given a translation from the German Auto, Motor und Sport magazine done by local expat resident Peter Wehrli. I was interested to see if the German press could be objective and unbiased, considering “their man” Michael Schumacher did not win the hoped for 8th world championship. The item began with “Alonso is the old and new champion. There was no happy ending. When the curtain fell, Michael Schumacher was only second. And yet, his last performance once again proved his extraordinary class. Schumi drove the race of his life as if he emphatically wanted to show everybody, for one final time, what we’ll be missing without him.” I certainly have no complaints with that wrap up. Schumi did show that he was still the master. The report also stated correctly that Alonso won his second title not least because he committed fewer errors than his rival. Again, totally correct. “Schumi crashed in Melbourne and Budapest, paid the parking fine in Monte Carlo and wasted valuable time by sliding out in Istanbul.” Spot on. The report was also objective in discussing BMW’s year, stating that generally points were beyond their reach. It also stated that you did not have to be clairvoyant to see that BMW is pinning its faith on the Pole Kubica, and not on the German Heidfeld. Last week was an easy one. I mentioned the Swedish Volvo P1800 as being one of those iconic cars, but it was not made in Sweden. I asked where was it made? It was made in the UK in the Jensen factory! So to this week. Which five cylinder diesel engined experimental record breaking car was originally built with a four chamber Wankel style rotary engine? Electric Hub Motors heralding another revolution? I firmly believe that the cars of the future will be electric. Forget the hybrid gasoline/electric combination, the future will not only be electric, but the cars will be powered by rechargeable batteries that you plug in overnight into the three pin system in your garage. Just like your current mobile phone. The latest developments in Lithium-ion (L-ion) batteries are showing that the concept of electric cars is far from finished. It was also evident that whilst there are some new technologies around the corner, at this stage, most of the development seems to be in refining old techniques. We should look at a little history of electric power for passenger vehicles. The leading manufacturer of electric vehicles in the world, at the end of the 19th century, was the Baker Motor Vehicle Company, started by Walter C. Baker in 1898. Indeed, the company still stands as the largest producer of electric vehicles in history, despite ceasing business in 1916. This shows that we have not really been furthering the concept since 1916, by which time we had fallen in love with the gasoline engine, to the virtual exclusion of other power sources. However, the manufacturers themselves are now also looking at hub motors for direct propulsion. A couple of years ago, General Motors demonstrated a low-tech, high performance technology that the automaker believes could improve vehicle acceleration, traction and maneuverability, and enhance the performance of hybrid electric vehicles. This was through the use of electric hub motors. While GM stated that although electric wheel hub motors have been used before on bicycles, golf carts and lawn mowers, one of their top engineers said the motors could provide enhanced performance on passenger vehicles. “You get the economy of a four-cylinder engine with the performance of a six,” said Jim Nagashima, who was manager of the advance development group at GM’s Advance Technology Center in Torrance, California. “Icy, snowy conditions can be sensed immediately and all the torque could be put onto one wheel,” Nagashima said in an interview. The use of wheel hub motors could become a cheaper, lighter substitute for the electric motors now used in today’s hybrid vehicles, Nagashima said. Of course, GM is not the only manufacturer looking at this technology. Toyota displayed their Fine N concept vehicle at the Bangkok Show last year too, which was designed around fuel cells providing electric power for four wheel hub motors. 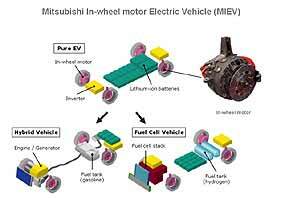 Another manufacturer to come up with a vehicle using this wheel hub motor concept is Mitsubishi, who believe that the fuel crisis will stimulate electric technology. The Mitsubishi MIEV has four high-efficiency direct-drive motors inside its 20 inch wheels, each producing 50 kW of power and 518 Nm torque adding to maximum output of 200 kW (270 bhp). And because this drive system allows precise regulation of power at each individual wheel, it opens the door to creating a vehicle dynamics control system in its ultimate evolutionary form. The MIEV is a proposal for next generation electric vehicles that utilizes the environmental technology Mitsubishi has been developing over the years. The in-wheel hub motors and the lithium-ion battery system, which is located under the floor to reduce the center of gravity, propels the Lancer Evolution MIEV from zero to 100 km/h in less than eight seconds and up to a maximum speed of 180 km/h. Performance figures that place the MIEV in the middle of passenger car performance. The foremost feature of the in-wheel hub motor is that it allows drive torque and braking force to be regulated with high precision on an individual wheel basis without requiring transmission, drive shafts, differential gears or other complex and heavy components. 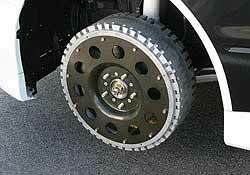 Housing the drive system in the wheels also gives greater freedom in designing the layout. The space-saving benefits of the in-wheel motor also offer exciting possibilities in terms of body design. So from many points of view, environmental, functional and breaking the dependence on fossil fuels, the in-wheel hub motors look as if they present a very tempting solution to many problems. What must not be forgotten, however, is that Dr. Ferdinand Porsche was the first to come out with electric hub motors, with the electricity generator being driven by a gasoline engine mounted on the chassis. This was in the Lohner-Porsche of 1902, a mere 104 years ago. The first hybrid! It seems as though the (electric) wheel has now gone full circle! Yes, it has been confirmed that there will be a Four Hour endurance race at the Bira circuit on the January 6/7 weekend. There will be two main classes with Honda Civics and Toyota Vios/Yaris production cars, though there are some additional freedoms being allowed, such as rear discs and non-standard ECUs. So there will be classes and sub-classes in each category. Each car must have a minimum of three drivers, and only one can be an “A Grade” driver per car. I have a personal interest in this event, having been invited to join the Pizza Company race team for the event. The Pizza Company team has done well all year in the restricted Vios class and the regular drivers include the ex Thailand GoKart champion Thomas Raldorf, Norwegian Martin Stuvic and Australian Paul Kenny. More on this event next week.